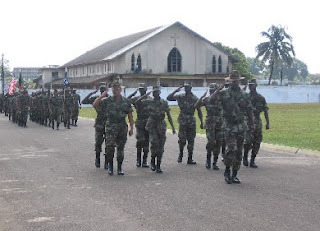 AFL, Armed Forces of Liberia, first graduation parade for troops trained by DynCorp. 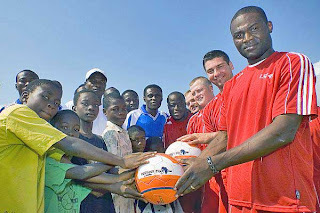 This article from Liberia’s Anaylst newspaper is quite enthusiastic about the training. One thing the creators of AFRICOM have not discussed publicly since its creation is the role of mercenaries, military contractors, in the military engagement with Africa. And no one should make any mistake, a military command is military engagement, no matter how much they talk about aid and diplomacy. This blog has discussed some of the potential uses and issues surrounding mercenaries and mercenary corporations, and how they might be used in Africa in the future, both by governments and corporations. In situations where government and social institutions have collapsed, as in civil wars, it is critical that there is accountability and oversight in the rebuilding process. PMCs simply do not have sufficient accountability and oversight built into their operations. In fact one of the reasons to employ them is precisely to avoid accountability and oversight. And Whelan points this out in her speech: “some times we may not want to be very visible.” She is quoted in an article in The Guardian that ties her to an attempted coup in Equatorial Guinea. If that is the case, it is another situation where the US has supported both sides of a conflict. Whelan says using the PMCs is cheaper than using the US military. However, corporations are in business to make a profit. Adding profit to the cost means a higher cost, cost+profit = bigger cost. 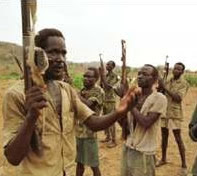 Alternatively, or even additionally, PMCs, or their employees, can increase profits by trading in contraband and human traffiking, and have been repeatedly implicated in these activities in Africa, raising profits for the PMCs, employees and employers, and raising costs, often paid in blood, by the people in whose lands they operate. The Analyst’s article on training the Liberian army seems quite pleased with the training that DynCorp is providing. Although it does ask some questions about the process for how the officer candidates are chosen, which seems to be minus any transparency. The author expresses some confidence because “the Americans are also monitoring the process against any abuse.” Given the record of abuse and corruption racked up by the Bush administration and its contractors in Iraq and in the US, I would not count on US oversight being very helpful at present. 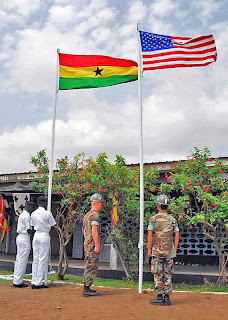 For example, today, Ghana’s ACOTA (African Contingencies Operations Training and Assistance Program) training program, both field and classroom, has been conducted entirely by civilian contractors. Now actually some of these contractors were reservists but nonetheless it was all contractor training, we did not have any active duty military participating in the training. Regarding the picture from Sudan above, if the US government hopes to be seen as acting in good faith by the government of Sudan, it should not be using PMCs to arm and train rebel groups. That is a fairly explicit indication the US is working against the Sudanese government for another “regime change”. It is unlikely to help the people in Darfur or southern Sudan, and it limits what the US is able to do in any diplomatic direction. And, it means more people will be hurt and die. Private Military Contractors (PMCs) are also big business in Africa. Brown & Root, a subsidiary of Halliburton, helped build a military base near Cyangugu, Rwanda just next to the Congo-Rwandan border. ”Officially,” Brown and Root was there to clear land mines, but instead housed mercenaries from Military Professional Resources Inc. (MPRI) who trained the RPF and Laurent Kabila’s ADFL for invasion of the Congo in 1996, and the Rwandan army’s re-invasion in 1998, after Laurent Kabila threw out the Rwandans, Ugandans, Bechtel and the IMF. The French intelligence service reported that U.S. Special Forces and mercenaries from MPRI participated in the murder of Rwandan Hutu refugees on the Oso River near Goma in 1996 and even claims to have turned over the bodies of two American soldiers killed in combat near Goma. The circumstances surrounding the unofficial recovery of these two U.S. soldiers remain very mysterious. MPRI is based in Arlington, Virginia and is staffed and run by 36 retired U.S. generals. It is contracted by the Pentagon to fulfill the African Crisis Responsive Initiative (ACRI). This program includes the Ugandan military, and it supplied military training in guerrilla warfare to Ugandan officers at Fort Bragg, North Carolina in July 1996. During the invasion of the Congo in 1998, Ugandan soldiers were found with ACRI equipment while Human Rights Watch and Amnesty International have implicated Ugandan battalions trained by ACRI in rapes, murders, extortion, and beatings of Ugandan civilians. Another mercenary firm, Executive Outcomes, has established other private military companies that operate around Africa. Cofounder Tony Buckingham’s Heritage Oil and Gas company works closely with PMC Sandline International to manipulate the petroleum options around Lake Albert. It is believed to have signed concession deals with warring armies and governments on both sides of the Uganda-DRC border. 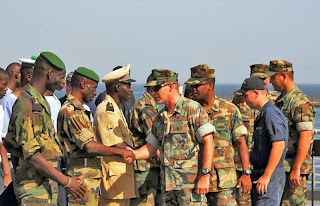 The expansion of conflicts, who profits and how, and who pays the cost and how, and the expansion of mercenary armies, is a looming danger of AFRICOM. It is something the African Union, the regional organizations, and citizens of African countries, need to watch. I like this picture because it seems to me the faces of the young Ghanaians in this photo-op reflect the range of skepticism and interest that many Africans feel about AFRICOM. The lack of any clear explanation or rationale for creation of the command. The complete lack of transparency in creation and presentation of the command. The creators of AFRICOM discount or disparage the advances Africa has made with respect to African security through the African Union as well as regional organizations. The African Union has important new security institutions, most notably the Peace and Security Council, which is charged with monitoring and preventing conflicts around the continent. In 2004, African leaders agreed to a Common Defense and Security Policy in order to enhance defense cooperation and ensure a collective response to threats to Africa and African states. Perhaps AFRICOM has a contribution to make in helping Africa achieve these objectives, but if so, this has not been explained by American officials. Rather than a clear vision, U.S. officials have painted a confusing picture of an organization that seemingly plans to mix economic development and governance promotion activities, heretofore the responsibility of civilian agencies, with military activities. Africans, given the history of military coups that once plagued the continent, tend to regard this militarization of civilian space with great misgivings.__ . . .
Why have U.S. officials insisted that the command’s role would include addressing such issues as political instability, human rights abuses, good governance, poverty alleviation, the building of health clinics and schools, and the digging of wells? These issues represent serious challenges in Africa, but a cross-section of people believe the military should be used to tackle them only in cases of emergency. Proposing them as long-term goals of the new combatant command has given the impression that the United States does not fully understand the concerns of Africans. It has also opened the way for critics to suggest that the American government’s good governance, development, and security rationales for a military command are a smokescreen intended to hide other and possibly nefarious objectives for AFRICOM. Africans know that the militarization of political and economic space by African military leaders has been one of the factors that has held Africa back for decades. While African states are trying to put the culture of military rule behind them, the United States appears determined to demonstrate that most civilian activities in Africa should be undertaken by armed forces. To some African policy makers, this suggests that the U.S. Government lacks sympathy for what Africans so deeply want today, namely democratic systems in which the armed forces remain in the barracks. African analysts and policy makers point out that in Africa today there is little or no transparency in discussions of AFRICOM or of U.S. military relations with African states generally. They note that . . . it has not been freely and openly discussed by the legislatures of the African states, even in countries that have been mentioned as possible sites for AFRICOM’s headquarters. This prompts the question: what governance ethos would AFRICOM foster in the future if its current relationships with African governments are shrouded in secrecy? African analysts and policy makers believe that the Americans are taking the AU for granted and neglected consultation with AU officials before its announcement. They claim that one of AFRICOM’s Achilles heels is that it has no plans to cooperate with the AU’s Peace and Security Council and that AFRICOM has the potential to undermine the Common Defense and Security Policy, which prohibits the establishment of foreign military bases on the continent. If AFRICOM has no mechanisms for dealing with the AU, it also has no way of cooperating with the regional security mechanisms based on organizations such as the Economic Community for West African States (ECOWAS), the Intergovernmental Authority on Development (IGAD), and the Southern African Development Community (SADC), which have played significant roles in conflict prevention and management. Failing to cooperate and coordinate, lack of transparency, and concealing information are all hallmarks of the Bush administration approach to everything they do. No one should be surprised that AFRICOM was conceived and executed in this manner. The complete failure of the US to consult or coordinate with the African Union in creating AFRICOM is a breathtaking combination of ignorance and arrogance. Of course this is how the Bushies have conducted themselves for most of their administration. It is how they conduct themselves within the United States. The actual practice of democracy is quite alien to them. Their approach at all times is: we’ll do things our way, we won’t consult, and if you get in the way, we’ll run over you. Rather than being strong, they have made themselves and their country steadily weaker. You can see more US Navy photos from the Photo Gallery – African Partnership Station. The Tema clinic is one of more than a dozen community relations projects planned during this six-month round of APS. “It is very gratifying that after all the visits our interaction in the partnership has yielded something very good. 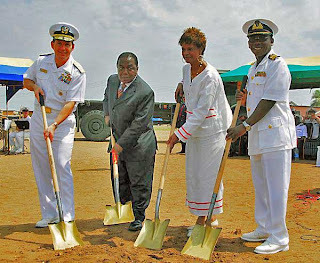 As we stand here today, we are going to witness the ground breaking for a medical clinic to be built by the U.S. Seabees in partnership with our work services engineers,” said Ghanaian Navy Commodore Matthew Quashie, Eastern Ghana Naval Command. “The facility that is currently on their base is old and worn, they’ve asked us to build a new medical facility right outside the Navy base so they can not only treat their military personnel, but so the local people can benefit from the clinic as well,” said Lt. j.g. Joseph Clements, project officer with Naval Mobile Construction Battalion 40. At the same time Nigeria has reiterated opposition to an AFRICOM base in Africa. There is an interesting interview with General Victor Malu, former Chief of Army Staff in Nigeria, on the subject of AFRICOM in the Daily Trust. Some years ago when he was the Chief of Army Staff General Victor Malu opposed the presence of American military in Nigeria. This earned him the fury of the then Commander-in-Chief, and Malu was consequently retired. Two weeks ago, the Americans renewed their moves to set up their African Command (AFRICOM) in Nigeria, but the Council of State rejected this. In this interview, Malu explained how the US first made its efforts, why he opposed it and what setting up an American military base here would mean. Malu: What the Americans wanted to do was not to set up a command. The Americans because of five years of Abacha’s administration that blocked Americans from developing or updating their intelligence on armed forces of Nigeria took the opportunity of somebody who had no knowledge about military in the name of Obasanjo to come and associate with him and convinced him that they wanted to train us for peace-keeping. Americans cannot claim that they want to train us for peace-keeping. We’ve succeeded in peace-keeping where Americans have not succeeded. What they wanted was to update their intelligence on the armed forces . . .
To make matters worse, even when we have reluctantly accepted because of the pressure from our Commander-in-Chief, to allow the Americans to train us, the Americans insisted they must live in the barracks with the soldiers. I left Abuja and flew to Sokoto to go and meet the governor, to plead with him to give us an area outside the barracks we would prepare it for the Americans. The governor accepted to do that. But the Americans turned it down insisting that they must live in the barracks with soldiers. I asked General Danjuma who was my GOC as far back as 1970, I said sir, you are my GOC in 1970, would you have allowed any army of any other country to come and stay with your own troops in the barracks? Well, at a point I didn’t know whether he understood me or not, but this was the type of argument that was going on. I don’t have direct evidence but I have every conviction in my mind that it was due to the interference of the Americans when they found out that I was becoming a stumbling block that they gave Obasanjo as a condition for their cooperating with him that he must get rid of the COAS. The issue of African Command is nothing but because of the oil interest on the Gulf of Guinea, going out to the Coast of Liberia and so on. Americans are finding an easy place where they can extract oil, and you know is a much shorter route than going around to go to the Middle East. WT: There is this report people are finding difficult to believe. Right now, the American soldiers are occupying the last floor of the Defense Ministry. Malu: I was in service before that happened. I remember I resisted that I was not going to have any American soldiers sitting with me in the building. That is to prove to you what I am trying to say. When America came we had a defence headquarters in the same place we have some blocks reserved for the Navy and the Air force. Americans are not interested in any of this, it was only where the army was. Having people sitting on one floor on top of you is like sitting with you, watching and observing everything you are doing. If America wants to create democracy by use of force they would have invaded Saudi Arabia. Why does the US NEED to have an enhanced military presence in Africa? I happened to be flipping through channels before I went to sleep last night and came across a Charlie Rose interview with General Kip Ward, head of AFRICOM. I’d like to find the transcript to get the words right, but could not find it on the Charlie Rose website, though they should post the video eventually. In the course of the interview Rose asked General Ward to imagine Rose was the head of an African country, saying he had heard a lot about what AFRICOM was not, could the General tell him what it is? (something that a lot of inquiring minds would like to know.) General Ward had his answer ready. I can’t remember his exact words, which is why I was looking for the transcript, but it was a completely meaningless answer, pure bureaucratese, meaning anything you want it to mean, the kind of answer that is a wall rather than a window. Why does the US feels it needs a military presence in Africa? What will the US military presence consist of in terms of military hardware and numbers of personnel? How does the US intend to operate and in what circumstances will it’s forces be mobilized? In what way will the US military presence dictate or determine the price of Africa’s natural resources and who gets access to them? In what way will the US military presence infringe on the internal affairs of independent African countries and determine their foreign policy towards other AU members? How will the US military presence influence the foreign policy of independent African states towards non AU countries such as China? How will the US enhanced military presence infringe of the rights of African citizens? How will Africom impact on continental migration and the rights of the millions of Africans without citizenship and the rights of refugees? The US has always been at the forefront of Free Trade Agreements. Now it finds itself in $billions of dollars trade deficit with China it is crying, forgetting that China’s industrial growth and huge export market is part of the same globalisation that the US is itself the main proponent. The difference is simply that China is in the driving seat and not the US. China is doing to Africa what Europe and the US have been doing for 100s of years. Instead of joining in Western economic paranoia we should recognise this is merely an extension of colonialism / neo-colonialism and economic exploitation and deal with it as such. The US and the West have their own issues with China and to some extent this is played out on our soil. We should be seizing the time and using this as a weapon to ensure we get the best deal for our resources and citizens. Unfortunately, one of the questions she asks, excellent as far as it goes, is not complete – What will the US military presence consist of in terms of military hardware and numbers of personnel? We also need to ask: what kind of military personnel? How and how much does the US plan to employ private military and intelligence corporations. I don’t think the greatest immediate danger posed by AFRICOM is from US soldiers and sailors. One of the things that worries me is that I suspect the mercenaries and mercenary corporations are what the US plans to use in Africa, in addition to training African military as US surrogates. These mercenaries may be employees of the US State Department, or some other US government department, as they are in Iraq. Or they may be the employees of giant corporations, such as oil companies. Whatever US objectives, arms and mercenaries can only destabilize. The presence of actual US military personnel may just be window dressing. The dirty work will be done by private armies and private CIAs. Already in the US these are taking over the functions of the military and intelligence. I am hoping a change in US administration may change the direction of this trend, but there are no guarantees. African Loft asked the question in an open forum: Does Africa need AFRICOM? This is the question that Sokari answered by asking her questions. I feel sad that Africa is still some “distant treasure island” to be fought over and protected for selfish interests by foreign powers. It was Britain and France some decades ago (colonial era 1) now its the USA and China (colonial era 2?). As already stated, almost everything the US does is based on self-interest. Nothing wrong with that, but that fact is worth keeping in mind by the so-called ‘beneficiaries’ of the current ‘magnanimity’ by the US. Now I will not be surprised if they get their way, because in the final analysis, all they have to convince is just one man in each country. In Pakistan, they convinced Musharaf who become an ally in America’s War, even against the wishes of some of his own people. It is no surprise that Liberia is offering itself as a base: no better way to ensure the country does not return to its previous chaos. Now Nigeria… Nigeria is the big prize! And that is where the ordinary enlightened person comes in. To ensure that no one man at the top mortgages his country for ‘personal’ gains. What’s the conclusion of this rambling of mine? No to AFRICOM. And nobody should dismiss contrary opinions by simply labeling them as “America-bashers”, no sir! There are facts that stare us in the face. AFRICOM or whatever does not make America bad, OK, so I am not making any judgment on their intentions. My take is simply as an African who thinks that my sovereignty should be respected by all. If you wanna visit my country, by all means you’re welcome, but first, apply for a visa, but I remain in command! Islamic radicals? Thank you sir! As far as labels go, America applies them as it suits their purpose. Here in Nigeria, the government calls the ‘militants’ “Restless Youths”, when they want to be magnanimous but otherwise, “Terrorists”. Little does the public know that these youths were armed by politicians who used them to fight their political battles, but failed to mop up the weapons after the operation: nor pay for ’services’ rendered. The targets have simply been changed. Same thing happened with America. The renegade and heartless Osama Bin Laden was an ally of America during the Russian incursion into Afghanistan. The Taliban and their likes used weapons that America provided through the CIA station agents in times past. When allies were changed, labels were changed. Terrorists yes, but it sure makes my hair stand to see people use labels for their convenience. The militant youth of the Niger Delta are employed as armed gangs by the politicians when it suits political expediency. They are discarded and treated as criminals or “terrorists” when they are no longer needed, or when they represent the opposition. And all the while huge and dangerous stockpiles of arms are accumulating all around. “In three days you learn a lot, but it isn’t very much time. The next time I hope to train for one week, two weeks, or a month. 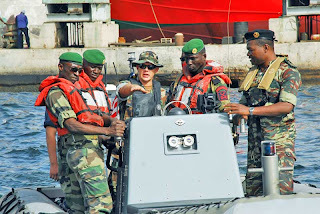 It’s good for my Army,” said Senegalese Marine Staff Sergeant, Fode Camara. The Senegalese Sailors and Marines learned about preventative maintenance, combat lifesaving, self defense and small boat maintenance and handling. 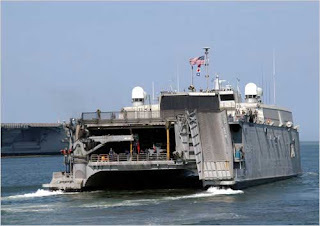 For more news from USS Fort McHenry, visit http://www.navy.mil/local/lsd43/. Chief of Defence Staff, General Andrew Azazi, has said despite Liberian government’s clamour to host AFRICOM, ECOWAS Chiefs of Defence Staff (CDS) would have the final say. The President and Vice President of Liberia both reiterated their support of AFRICOM. Azazi said though Liberia is a sovereign country, AFRICOM was a bit more technical to be treated as politics. “The President addressed it when she met with us and the Vice President said ECOWAS should support Liberia, but what we feel is that nobody at the political level in African Union or ECOWAS knows enough about AFRICOM to make categorical statements. We are advocating that is not an issue for Chiefs of Defence Staff solely, we are advocating that at the political level, there should be either bilateral or multilateral interactions to create awareness to convince African leaders that AFRICOM will be good for Africa. What it means is that Africa must be willing to accept AFRICOM before it is sited. So if Liberia already is thinking of hosting AFRICOM, maybe they have a better understanding than the rest of them, but like the President told us, there are two things, we (the ECOWAS CDS) are going to discuss AFRICOM if our advise is that it is not good for the continent it will be rejected and if it is good, it will be accepted. Otherwise, the general understanding is that AFRICOM is suppose to be good for capacity building, but what we are saying is that we should have a better understanding of all that is going to come about, let’s create awareness, let’s be a partnership that will help both sides,” he said. Defence sources in Nigeria had in September, disclosed that the Nigerian government was already making serious diplomatic inquiries into the US government’s establishment of a military base for Africa in Stuttgart. This sounds like the ECOWAS Chiefs of Defense Staff are trying to act together and in accord, and that they are not interested in letting one country break ranks. As I understand this, if West Africa were to host AFRICOM, there has to be more information forthcoming from the US, and agreement between West African governments that it works to their advantage. I wonder if this solidarity will hold. And I wonder how this advantage, or lack of it, will be measured. I wish the CDS success in this endeavor. I don’t see how the US can provide information that will genuinely answer the CDS questions. The US has been telling Africans that AFRICOM is not all the things the US media tells the US public that it is. 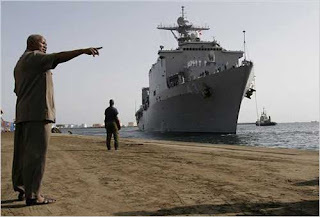 The USS Fort McHenry in Dakar Senegal. This picture was attributed to a US Navy photographer by the State Department. Then later MSNBC attributed it to an AP photographer, Rebecca Blackwell. As per a comment from b real, this change in attribution looks rather like state propaganda. 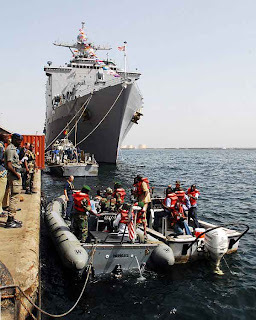 Africa Partnership Station (APS), embarked aboard amphibious dock landing ship USS Fort McHenry (LSD 43), escorts news media into a rigid hull inflatable boat (RHIB), while the Senegalese navy displays their training. West African military chiefs charged that the United States has failed to adequately consult with countries that will be affected by a planned American military command for Africa. “The heads of state should be fully briefed; the heads of state should ask pertinent questions that will give them the direction to cooperate fully,” said Col. Toure Mahamane, head of political affairs, peace and security with the commission of the 15-member Economic Community Of West African States, or ECOWAS. He said the U.S. had neglected such procedures in a disregard for common “due process” on the continent. 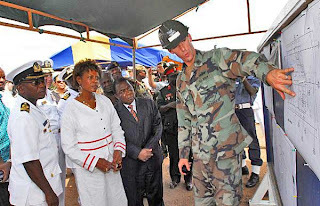 Africom: The new US military command for Africa by Daniel Volman.
. . . the difference between Africom and other commands—and the allegedly “unfounded” nature of its implications for the militarization of the continent—are not as real or genuine as the Bush administration officials would have us believe. Of course Washington has other interests in Africa besides making it into another front in its Global War on Terrorism, maintaining and extending access to energy supplies and other strategic raw material, and competing with China and other rising economic powers for control over the continent’s resources; these include helping Africans deal with the HIV/AIDS epidemic and other emerging diseases, strengthening and assisting peacekeeping and conflict resolution efforts, and responding to humanitarian disasters. But it is simply disingenuous to suggest that accomplishing these three objectives is not the main reason that Washington is now devoting so much effort and attention to the continent. And of course Washington would prefer that selected friendly regimes take the lead in meeting these objects, so that the United States can avoid direct military involvement in Africa . . . The hope that the Pentagon can build up African surrogates who can act on behalf of the United States is precisely why Washington is providing so much security assistance to these regimes and why it would like to provide even more in the future. Indeed, as argued below, this is actually one of the main reasons that Africom is being created at this time. U.S.S. 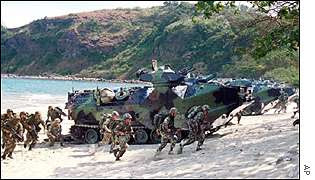 Fort McHenry amphibious assault ship will begin a six-month deployment to the Gulf of Guinea in November 2007. The ship will carry 200-300 sailors and U.S. Coast Guard personnel and will call at ports in eleven countries (Angola, Benin, Cameroon, the Republic of the Congo, the Democratic Republic of the Congo, Equatorial Guinea, Gabon, Ghana, Nigeria, Sao Tome and Principe, and Togo). Its mission will be to serve as a “floating schoolhouse” to train local forces in port and oil-platform security, search-and rescue missions, and medical and humanitarian assistance. According to Admiral Ulrich, the deployment matches up perfectly with the work of the new Africa Command. “If you look at the direction that the Africa Command has been given and the purpose of standing up the Africom, you’ll see that the (Gulf of Guinea) mission is closely aligned,” he told reporters. The USS Fort McHenry arrived off the coast of West Africa in November to lead an international team of experts that will train African sailors to confront the daily challenges of illegal fishing, piracy, drug trafficking and oil smuggling. It is easy to add this lack of a funding request to the list of behaviors that make it look like the US is training Africans to act in US interests, and not in their own interests. Although I am profoundly skeptical about US military assistance in Africa, this is the area where it could conceivably be helpful. The US war on drugs has been a resounding failure. The US training for Latin American military has been a breeding ground for coups and crime. So maybe Africa is better off without that kind of help. But the fact that no 2008 funding was requested for this program is worth noting. It does not look like any country is turning down the training the US is offering. I think it would be foolish to do so. It is always useful to see first hand what your “neighbors” are doing and planning, particularly if they are concealing their motives and intentions. Before Bush, US military training was the best in the world. Now, with the Bush administration reliance on mercenaries, and with the US military increasingly deployed in Iraq without adequate protective gear, training, or rests between deployments, the US military is in serious trouble. What effect this will have in Africa remains to be seen. Oversupplies of arms and mercenaries look like the biggest danger. Civilization! – *Some Restrictions Apply. This Civilization is a lot like Bush’s Democracy, not to be confused with actual democracy. I’ve hardly had time to look at the news or this blog this week, with lots of projects going on. I hope to have a bit more time over the weekend. The busy pace may continue for another 2 weeks.